STAY IN PLACE WHILE EXERCISING – These workout gear stay tight and snug during your whole workout equipping you to take your workout to the next level. INCREASE BLOOD FLOW & REDUCE PAIN- Our 7mm thick neoprene knee compression sleeves will help to keep your joints warm and increase blood flow which will also aid in pain reduction. PREVENT INJURY AND RECOVER FASTER- Knee compression sleeve is Proven to Promote Muscle Recovery & aid in Injury Prevention due to the compression that it provides. 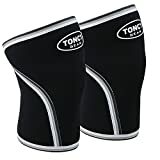 Knee injuries are a major problem in sports around the world.Knee sleeve is an attempt to reduce the occurrence or severity of injuries to the knee joint ligaments without inhibiting overall knee mobility. Best used by both men and women. Choose the correct size to get the right fit. As with all things compression, knowing your size is key. If the knee sleeves are poorly fitted, then they will do nothing but add an extra garment to your knees. Make sure you take the correct measurement of your knee and review the sizing charts provided. Our Knee sleeves come in 4 sizes small, medium, large and extra large. Knee sleeves are preferred by powerlifters, as their goal in competition is to move as much a weight as possible. However, the workout gear is also commonly used in the CrossFit community, given their versatility and the fact that they help athletes to recover from heavy lifting sessions, Gym and Other Heavy Fitness Workouts too.